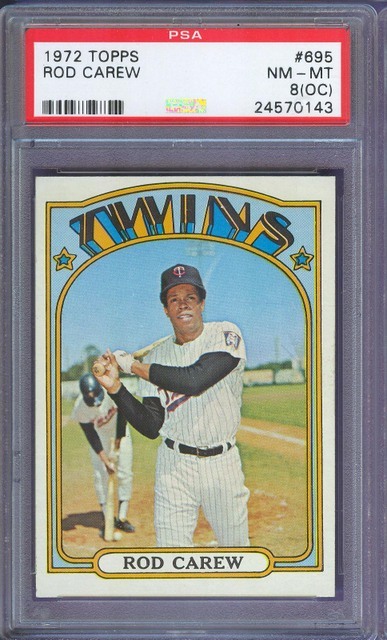 I consistently see off-center cars with the same grading number sell for about a third of a card that is centered well. Why doesn't PSA just take into account that off center knocks the grade down rather than putting a grade reflective of the condition except the centering, and then putting an OC. For example PSA 8 OC should get rid of the OSI designation and just knock it down to a 6 or 7 because of the off centering. 1. Eye appeal is subjective. 2. Their standards exist for a reason and they can't change them (to suit people's tastes). 3. It's also not accurate to grade a card a 5 just because the centering is bad when the physical card itself is pristine. That would just create a new market inefficiency where people start paying premiums for sharp cards with less than perfect centering because they've been undergraded by the "professionals." Interesting how you can ask for no qualifiers and then question the grade with PSA, I guess at least you know what your getting when you have the o/c designation. Although, I agree, it is one of the main parts of grading but every company does something a little different. I see your point, but the reality is people pay foar less for a card when it's off center they grading should reflect that market reality. I see your point, but the reality is people pay far less for a card when it's off center the grading should reflect that market reality. What people decide to pay is reflected in the card and it's condition, including centering. If a OC 7 wasn't OC, it would be graded an 8 or higher so what you are asking for is already in place. Oh, ok. I didnt know that. I personally prefer a PSA 8 OC or MC over a PSA 6 or 7 (centered), especially if the color and focus is rich and clear. I collect off center cards and I am usually pretty excited when I can pick a PSA 8 or 9 OC/MC for much less. I simply look at it as the technology of the time and that miscut cards are just the way they came out sometimes, often times. It is more important to me that I see the player clearly then see him centered. So I don't mind PSA's current system. Last edited by tjenkins; 10-25-2016 at 10:56 PM. I personally prefer a PSA 8 OC or MC over a PSA 6 or 7 (centered), especially if the color and focus is rich and clear. I collect off center cards and I am usually pretty excited when I can pick a PSA 8 or 9 OC/MC for much less. I simply look at it as the technology of the time and that miscut cards are just the way they came out sometimes, often times. It is more important to me that I see the player clearly them see him centered. So I don't mind PSA's current system. 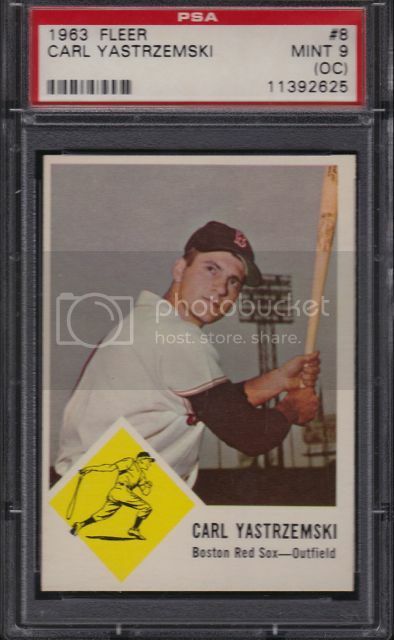 ..I'd bought the BVG 4 '58 White Letter Clemente because I knew that it was certainly not a "4" , except to Beckett Vintage Grading ; but the Beckett grader's hands were tied ; they could not give a final grade above a "4" despite how effing gorgeous the card is because the lowest sub-grade was a "2"---the other subs were all "8" with an amazing "8.5" for surface ; this is literally a pack-fresh card from 1958.. Speaking of centering, how are (oc) and (mc) different? Is the (mc) simply worse than (oc) ? Or can (mc) also include flaws that are not (oc) ? Miscut is when a part of another card is visible on the card or a portion of your card is cut off. Off-center is when the entire image is on the card, but not centered. PSA is more lenient to sets like 1955 Bowman if the miscut is on the back, they might not even give it the MC qualifier. Great example. IMHO, Beckett's 4 is more accurate because it takes into account the market reality. But I see your point as well. You think this would sell closer to a PSA 4 price than a PSA 6? Because that's the general consensus when it comes to the OC/MC grades: a two-point drop. Considering few people will buy OC cards, 4 is probly more accurate. OC cards on ebay go for a small fraction of well centered cards. You're wrong. A PSA 8OC will sell for less than a straight 8. It will sell for less than a 7. Occasionally it might even sell for less than a 6 - sometimes. But an 8OC will sell for more than a PSA 4 every. single. time. There's no room for opinions here, that's a stone cold fact. You are correct that cards with centering issues sell for less than more centered copies. Conversely, there is a premium attached to more centered copies and a dead nuts centered PSA 7 will often outsell a moderately centered PSA 8. But the market reality is that the impact is less than a 4 grade swing. FACT. But this card is miscut, not off centered. I don't think you can just say 2 grades for a qualifier. To me miscut is going to sell for a lot less than off centered. Also consider a card with ink. A small mark on the back will sell for a lot more than large mark on the front. Unless I'm misunderstanding you, that's not correct. If an OC 7 wasn't OC, it would be a 7. It only gets OC if it doesn't fit within the centering allowance for a 7. 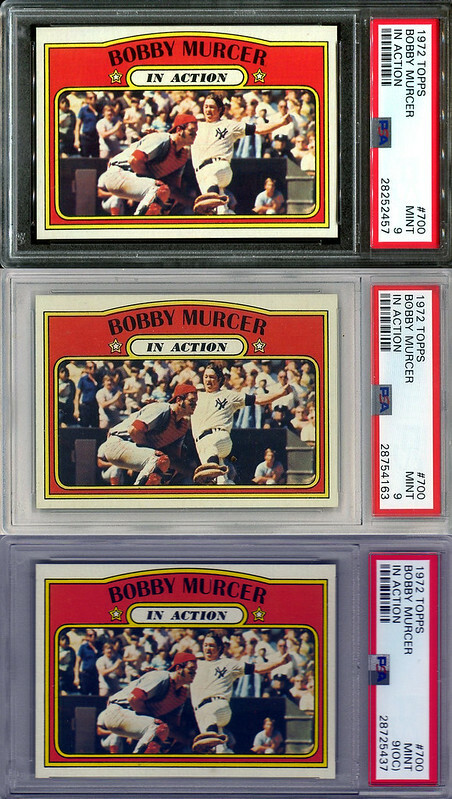 With PSA's grading, there are boundaries with how much a card can be off centered. Even their "10's" have limitations, they don't have to be perfect but with centering outside of their guidelines, I can't help but think the card would fall to a 9 if it didn't meet their criteria? Also, if you were to submit a card that you requested there be no qualifiers on, your card, if it was really an 8 OC, would come back as a 7 or less, would it not? Not saying you're wrong, Batpig, and that I'm right, that's just the way I understand it. Last edited by irv; 10-29-2016 at 07:05 AM. Also, if you were to submit a card that you requested there be no qualifiers on, your card, if it was really an 8 OC, would come back as a 7, would it not? In this scenario you described, the card would most likely be a 6 at the most. Yes, you're right. I should have said a 7 or less. A PSA 7 OC is considered to be a 7 in every way except centering. 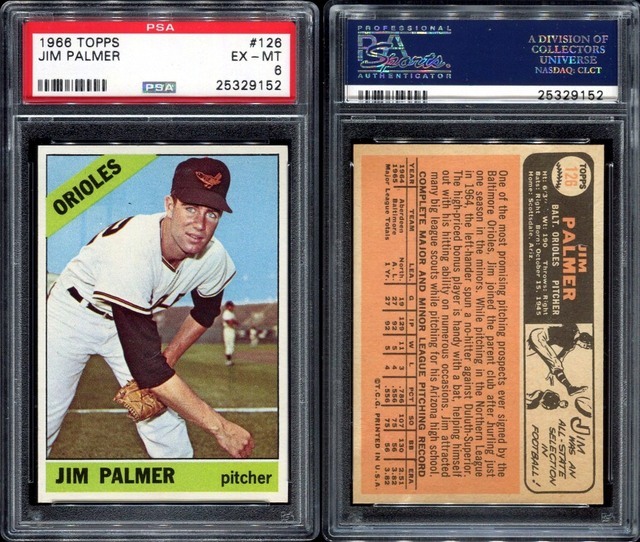 If the centering was improved it would be a straight PSA 7. That's what the qualifier means. If a PSA 7 OC was cracked out and submitted with "no qualifiers", it would most likely come back a PSA 5 but a 6 is possible. Thanks. I now see Batpig was right in what he was saying. I was thinking more in the lines of what I was saying, if you requested no qualifiers, the card would drop a grade or 2. But, with that being said, has anyone seen a "10 OC" card before? No, PSA does not issue 10's with qualifiers. So a 9 OC, if PSA issues 9's with qualifiers, could be a 10 if it wasn't OC? Haha,'now you're just screwing with me. I look for high grade OC cards with eye appeal because that is how I remember them from the pack. Most cards from my childhood (the 1970s) were somewhat OC out of the pack. It doesn't bother me the way it bothers collectors who were kids in later decades when the precision of card manufacturing was just a whole lot better and who've since moved into older cards. The Dr. J on the right is my favorite ever example. The back of the card is OC but who cares? I just try to shop where the money isn't going so I can indulge my habit at the cost of a bratwurst lunch rather than a steak dinner. Last edited by Exhibitman; 10-31-2016 at 12:41 PM. Totally agree about the overall eye appeal. Similarly, it is more distracting to me if the OC is L/R rather than T/B, with a bottom 'heavy' border (usually) being the least distracting. I have never understood the fascination of people and their dis-like for cards that are OC. When these cards were were made 50 or more years ago I do not think that the makers cared one way or the other what they looked like.I do understand why they draw a premium because likely only 1 in 100 are truly well centered.So if you are of the age that you opened packs of 52 topps baseball or 51 Parkhurst hockey than I am pretty sure that as a 7-10 year old kid you probably did not care much about centering.I am pretty sure it was all about your favorite player or team.I believe this centering thing has all become relevant when collectors turned dealers realized they could get a lot more for these cards that are centered well.Than grading took over and bang we have this what we have today. I know for myself that I have no concerns what so ever with the condition of any card that I as a collector have absolutely no control over.Things that happened at the factory so to speak.Things like centering,rough cuts.But problems caused by us as collectors like surface wear,dinged corners,creases,tape glue writing etc..than those do bother me. Good way to put it, Winston. I too care far less about centering than I do creases. Dinged corners are one thing but creases that go across a player face etc, bug me the most. You'll see in my Flickr link below that I own many OC 52 Topps cards. Granted, this is how they were given to me, but when searching for 52's to add to my collection, centering is the least of my concerns. Check out my Zernial card that I recently purchased. Sure, I'd like a better centered copy, but that will come someday if I feel like spending the money. I have upgraded my Fannin card only because the creases went across his face, or a good portion of the card. I have a few more like that and will likely upgrade those someday as well, but as far as upgrading my OC cards,,,, those can wait as they bother me the least. What I will never understand is how a card that has a rough cut is not downgraded. Their grading does reflect it you just don't seem to understand it. A 9 oc for example is not a 9 so you saying it sells for a third of a 9 so why put a 9 but it's not a 9 it's a 9 oc. Meaning it has all the attributes of a pack fresh card except this one flaw. It is more not less descriptive by having such criteria no one that knows what they are doing would expect it to sell in the same neighborhood for the record Manny 9oc cards sell at far less than 1/3 of unqualified 9 cards and that's ok that's the market. If you prefer just the straight grade you can request that and they will grade based on that. Some qualifiers they don't allow you to opt out of but oc is one you can. I didn't realize they were downgrading cards because of that. That was very common on many of the 60's and 70's cards. How much does it knock it down? 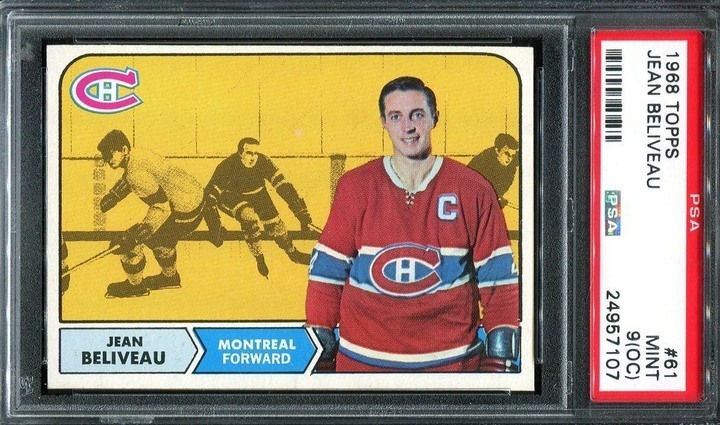 Depends on the issue; many O-Pee-Chee cards were cut direct from the factory with a rough cut because of their machinery. Those are normally not discounted for being rough cut, and in fact, are looked at positively since they couldn't be trimmed. PSA will most likely grade non-rough OPCs from sets that had that as the overarching production process and consider them altered even if they meet the minimum size for the issue. That's why you'll see Gretzky 1979 OPCs from uncut sheets go to Beckett to be graded, since they grade cards cut recently from sheets. Having a rough cut proves (effectively) that it was cut at the time the card was produced and inserted into packs. Read his post again. He said they do NOT downgrade for rough cuts. Last edited by DBesse27; 11-03-2016 at 04:52 PM. Duh, you're right. That makes more sense to me. I prefer centered cards because that's the way they were supposed to look. OC and MC cards might have come that way from the factory, just like cards that have print defects or poor registration. But they're still flawed. I'd rather pay more for a centered card with great eye appeal, or find one with a lower technical grade. Many vintage cards are like small works of art. You wouldn't hang a painting on the wall at an angle, or with a frame with one side bigger than the other . Why settle for an off centered card? When I first joined the site and was learning, I couldn't believe OC cards were graded so harshly considering that is the way they came from the factory. I could easily understand dinged corners, creases and other issues as they were the direct result from human interaction, but, like new cards that were just OC from the factory surprised me. I get it though, you can't grade a card a 10 that is perfectly centered and also grade one that isn't. Great post. And agreed in a lot of ways. Being a kid and just having a certain card at all...say a Steve Carlton rookie in okay shape...was a true delight. I tend to seek out high condition cards post war but a little OC or tilt doesn't make me completely disregard...because, deep down 10 year old me is in there saying "wow, that's a Steve Carlton rookie!!" To start - I guess I’m not quite sure why it got an MC instead of an OC - the part where the OC is the worst is at the top, and though close - you can still see a sliver of white border. The back is centered L-R better than the front, but even on the top - does not show a portion of another card. Whatever, I have dealt w/ PSA long enough to know that they are inconsistent with this type of qualifier at best - and in either case, the centering of this card and it’s effect on the eye appeal does not bother me in the least. If you look at this long enough, you can tell that from a technical point of view the centering is pretty lousy - but something about the borders and the portrait art together with this just works to make it not that much of an eye sore. 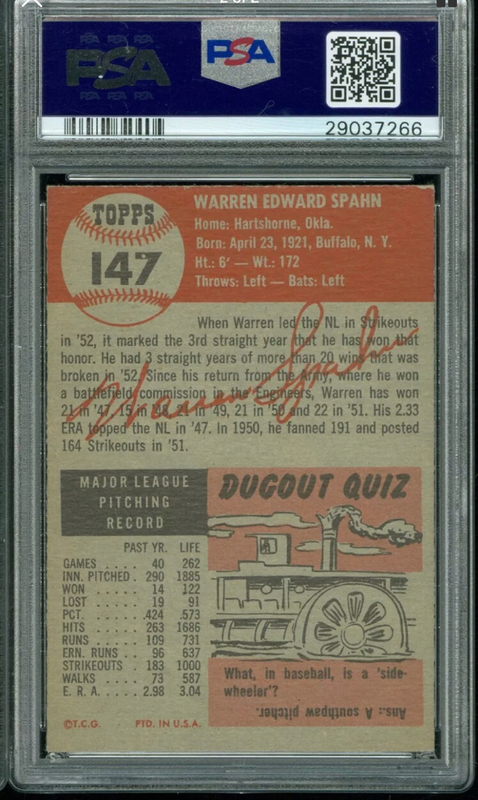 The portrait at an arm’s length to me looks centered well enough with the bottom, placard area of the black border where Warren’s name is to still make this a very attractive card. At the end of the day I’ll take it. 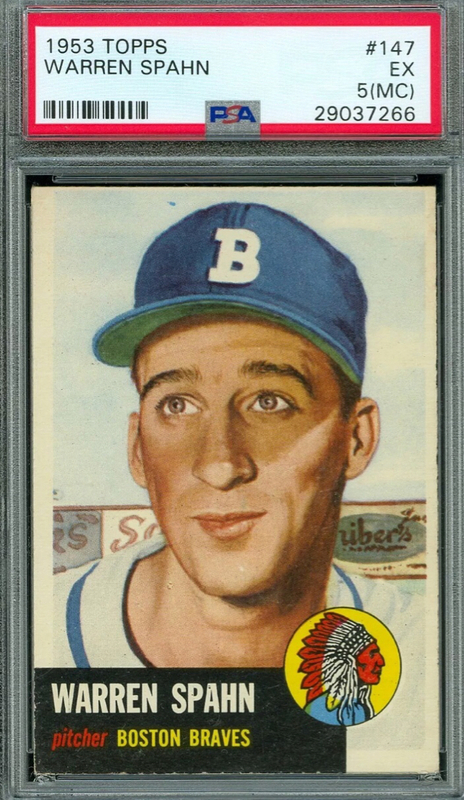 For a tad more than $50 delivered, I have a 65 year-old card in a PSA 5 case with sharp corners. That’s not something you see every day. This card in a straight 5 recently sold on eBay for $86, an 8 of course something ridiculous like $700+. Thanks guys for starting this thread. It’s changed my perception on OC/MC cards and what can still be appealing. Last edited by jchcollins; 05-29-2018 at 11:34 AM. Apparently sgc has also jumped on the kill the grade centering bandwagon. A psa 7 MC they told me would be an sgc 3! They used to be a haven for cards that were slightly off center or mc to get a fair grade based on corners and surface, but that ship has sailed. A psa 7 MC they told me would be an sgc 3! They used to be a haven for cards that were slightly off center or mc to get a fair grade based on corners and surface, but that ship has sailed. That seems rather harsh, especially coming from SGC. A card with an otherwise 7 appearance even miscut is going to look pretty out of place in a 3 slab with other "NM" attributes. I hope this is not a larger trend...PSA I can understand going more with the popular sentiment, whim - making grading more difficult over time - but SGC has always had the reputation of being the fair graders with collectors. In the end, if this continues - it just goes more to prove the point I've been trying to make for years - that all grading, no matter how "professional" - is subjective. Last edited by jchcollins; 05-29-2018 at 01:06 PM. It's sad if that's true. Following the trendy thing isn't always good. I thought this one was reasonably graded. These two were maybe switched? The top two cards, 9's without qualifiers, were/are listed for around $120 each. I ignored them and bought the nearly indistinguishable bottom card for, if I remember correctly, around $20. The only difference among the three is my card is a hair closer to the top border than the other pair. That's it. The bottom card was the one to get, I agree. Being a kid and just having a certain card at all...say a Steve Carlton rookie in okay shape...was a true delight. 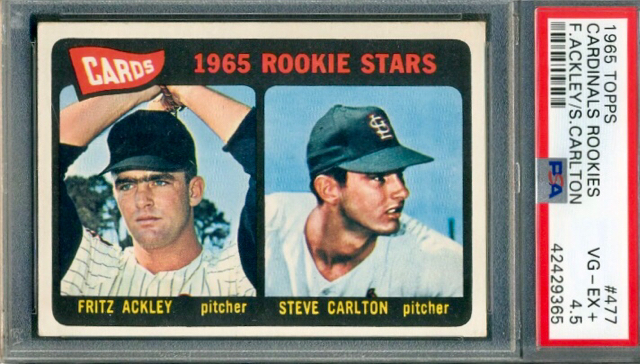 I tend to seek out high condition cards post war but a little OC or tilt doesn't make me completely disregard...because, deep down 10 year old me is in there saying "wow, that's a Steve Carlton rookie!!" Last edited by jchcollins; 03-27-2019 at 01:26 PM.